Interesting piece of information: On Facebook I follow a few different Pizzeria's. On the day I set out to create this pizza, one of these pizzeria's posted that the daily special was...you guessed it! 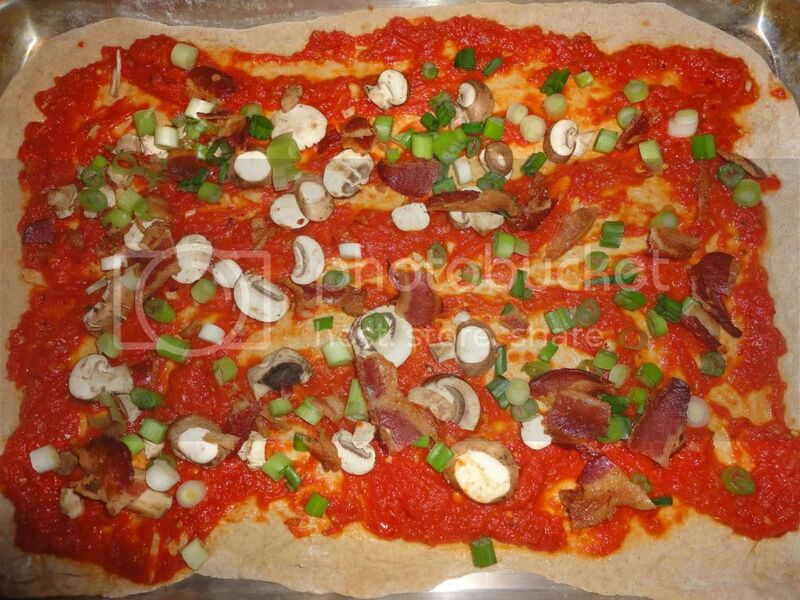 A Bacon, Mushroom and Green Onion Pizza - with RED SAUCE! Unbelievable! Anyway, I made the sauce from scratch, using the same recipe as did for Pizza Experiment #2. Mix together 3 cups Flour, 1 Tbsp. Baking Powder and 1/2 tsp. Salt. Slowly mix in 12 oz. Flat Beer, dough will be sticky. Knead the dough on a floured surface. Split dough for thin crust or use as one thick crust pizza, roll out, top and bake! Bacon, Mushrooms, Green Onion and Mozzarella Cheese! Easy-peasy and delicious to boot!